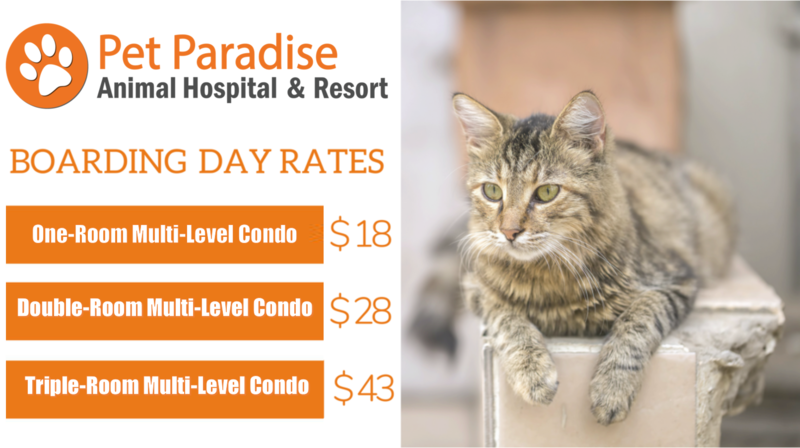 Each canine guest will enjoy of day camp activities in our “Tropical Oasis”. All boarding guest that meet our Day Camp Requirements and have passed the temperament test are eligible for daycare during their stay at no additional cost. We guarantee you they will have a blast and will be spoiled rotten by our passionate, trained staff. For dogs only. Includes Day Camp activities. For dogs only. 30 square-foot room, includes Day Camp activities and complimentary go home bath after a seven-night stay. For dogs only. Completely enclosed 35 square-foot room with private flatscreen TV, raised comfy bed, Day Camp activities and complimentary go home bath after a seven-night stay. *Siblings sharing one room will receive 20% off the second pet. Plush, comfy rugs are provided for each guest. We invite you to bring labeled comforts from home to accompany guests during their stay. We will not accept big pillows, beds, or comforters. We are NOT responsible for damaged or lost items. No pick ups between 12:30pm – 2:00pm, it’s nap time! Give your dog the ultimate Pet Paradise experience!